This was the longest appointment, all the regular initial stuff was performed, and Dr. Borow took Lauren's weight, blood pressure and performed the first ultrasound. On the ultrasound, the baby's heartbeat is clearly visible, and the whole blob seems to be blinking. Yup, Lauren's coffee pot is percolating. 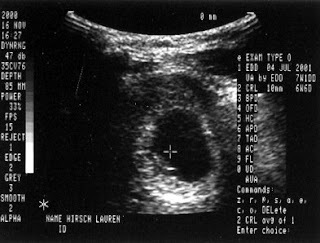 Lauren is seven weeks.